Our beautiful Baroque crystal glass beads have been produced in Bohemia since the 13th century. Bohemia was a part of the former Czechoslovakia, now part of the Czech Republic, and was famous for its beautiful and colorful glass.It was especially outstanding in the manufacturing of glass in high Baroque (diamond shape) style from 1685 to 1750. In the 17th century, Caspar Lehmann, gem cutter to Emperor Rudolf II in Prague, adapted to glass the technique of gem cutting with copper and tin wheels and in essence started the tradition of fine quality tin cut crystal beads.The history of Bohemian glass started with the abundant natural resources found in the countryside. Bohemian glassworkers discovered potash combined with limestone and silica and mixed various quantities of lead to create a brilliant crystal bead that started our modern day jewelry industry. Centuries ago these expert Bohemian craftsmen artfully crafted diamond-shaped crystal beads that are still produced today. 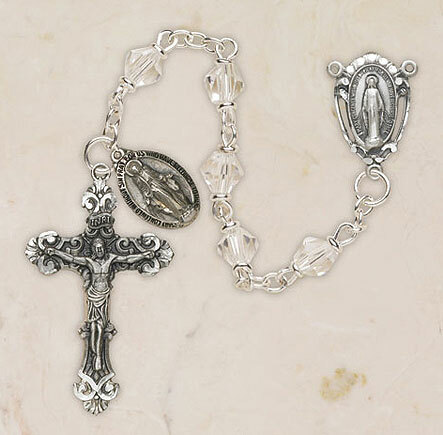 Creed is proud to offer these Baroque crystal beads with our unique loc-link construction and Italian silver oxidized centers and crucifixes.All rosaries are assembled with Heritage Italian-made 134 silver oxidized crucifix, 34 center and Miraculous Medal, and feature 5 x 6 mm crystal beads and rhodiumplated chain.